Spicy Treats: Kaju Pista Roll - My 300th Post N A Giveaway ! Yep,Today I am Writing 300 th Post. I am so happy and excited, woke up early in the morning started making sweet to celebrate the moment :) Blogging has changed my life a lot, made me more energetic creative and over all more colorful. My first blog was about my life love story :) That time also, i use to recollect all my sweet memories and tried to wrote my real story with lovely quotes and poems. But later, lots of pressure from my family members not to continue so i stopped writing and also 2 years back my kids were all infants and they need my attention 24/7 :) Then finally i learned myself to create a food blog and started posting my recipes. First few months, like you all i was posting my recipes with full enthu i didn't bother about anything / anyone...keep on posting 4-5 recipes per day and cooking a lot. Yes, i was so much addicted and later when i saw people commenting here and joining my site which again doubled my energy and fully dedicated...Without you all i couldn't reach this soon and so i thank each and every one who visit my space and also a very very special thanks to all my dear blog buddies who always supported and encouraged me thru their valuable comments and often embraced me by showering awards and much more. Thank you n Thank you friends !!! Actually i want to post Kaju Katli as my 300th post but on Nov 10 th , i want to share my sweet memories with my friends so i posted it earlier. And again thanks a ton gals for all your wishes on that day:) For the first time i tried this Kaju Pista roll and it was a grand success :) I never thought that i could made these delicious rolls at home. this is also my H's favorite and He enjoyed . My kids , OMG they don't have patience and today also i suffered lot to take pictures with them.I already gave some pieces to them but they want the whole big rolls :) and fighting with me and at last i couldn't shot anything creatively , simply took few pictures and gave it to them. When i googled for this recipe, i am able to found only few recipes which are easy and handy. Sanjeev Kapoor's recipe was the one tried by most of the people, as i am fine with kaju dough making i need only the way to make pistachio stuffing. So took his recipe and recreated . Plz refer my Kaju Katli recipe for detailed picture for making cashew dough.Now to the recipe.. Spread the raw pistachio in a oven safe dish and keep it for 8-10 minutes and set aside to cool completely. Once it had cooled completely, grind it in a blender along with sugar to a fine powder. Then sift the powdered sugar-pistachio mixture using a strainer. Now transfer the sifted pista powder to a bowl, add food color n milk mix everything well and keep aside. Take a pan , add sugar and water and cook in medium heat. Keep stirring until sugar dissolves completely and get fine thread like consistency. To check this, take a small bowl with 1-2 tbsp of water and drop few drops of sugar syrup and it should form fine threads and is should not dissolved in water. Now turn off the stove and pour the cashew mixture to a greased plate and wait for a minute( to cool) and grease your hands and add milk and milk mawa powder and start kneading it gently like a dough. Keep kneading the dough until it forms a smooth dough and cashew mixture starts leaving oil. Now Divide the (cashew) dough in to four equal portion and take one portion and roll it on a greased surface/butter paper to a rectangle shape. Then take about 1tsp of pista-sugar mixture, roll it to a long thin cylinder like shape(see picture) and keep it on one end of the rolled cashew dough and start rolling tightly. Roll it tightly then cut the rolled long cashew pista in to 2 " long pieces and trim the ends so that the pista stuffing tweaked out. Tap both ends gently on the plate so that you will get a smooth round ends. Do repeat the same for remaining cashew and pista dough. If you want, you can decorate them with varak/edible silver paper. Kaju Pista Rolls are ready to Serve !! As the cashew dough cools, it get dried up little so don't panic, add few drops of milk and again knead on a greased surface to get back its shape and texture. 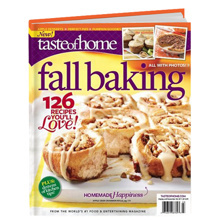 i am here with a giveaway- a very useful and wonderful book " The taste of Home "Fall Baking" . i have chosen this because we all love to bake and prefer homemade freshly baked goodies right?? i have already recieved, the taste of home cookies book and i liked it a lot. so thought to give a lovely book from Taste of Home and choosen this Fall Baking . Bonus: Homemade Halloween treats sure to scare up fun! and some more facts about the book..
Fall is the perfect time of year to turn on the oven and bake a delicious treat to share with family and friends. In the new edition of the Fall Baking Cookbook, you'll find 126 scrumptious recipes that feature the comforting flavors of autumn. Each recipe has been tested by the professionals in our Taste of Home Test Kitchen to ensure great results every time! Currently this giveaway is open to all US Readers/ followers only ...sorry,next time will do for all. Follow my blog Publicly , if you are already following just leave a comment. Like "Spicy Treats" Facebook Page. Just visit Spicy treats FB page and click "Like" Button or Simply Click on Facebook Pop out here (right side) n press "Like"
Subscribe to "Spicy treats" via email. Only verified email subscribers count as an entry.To subscribe enter your email Id below and please verify your email once get confirmation from FeedBurner. Spread about the giveaway in your space or FB is highly appreciated. I will select one lucky winner (rangom.org) at the end of December 2011. Wow..very yummy rolls..very delicious and glad for your 300 posts,Congrats ..Keep Rocking! !wishing many more yummy delicious posts!! "Enthusiasm is the engine of success"..Really it's great achievement. Keep on posting more creative and interesting recipes like this :) Kajju rollS luks soo yum.I can feel the taste from here! !Thanks for this Wonderful easy recipe. I am already ur follower, have liked ur FB page now (I know its late ;) )..and also subscribed via email...wonderful book for the giveaway !! Congrats dear on reaching 300 posts.Kaju rolls look so perfect and yum,wish I could make them like you.Wishing you many more happy events in blogging. looks extremely delicious, congrats on ur milestone! I subscribed to Spicy treats as well!! Hey Kaju pista roll looks super tempting...Lovely giveaway too..
Congrats on your 300th post..Kaju pista rolls are delicious..
congrats and may more recipes come from ur blog alrady follow u congrats again for winner in saji's blog. Congrats Sangee on ur 300th post and keep going. Kaju Pista Roll is really good. Very tempting kaju pista rolls,excellent preparation n presentation.Looks very tasty. Congratulations Sangee..300 posts wow! you are an expert, your enthusiasm for blogging is mind blowing. Keep up your good work. This kaju pista roll looks superb, very neat and just like what we get in stores. hearty congratulations sangee ! wishing u many more heart-warming milestones. Keep cooking and spread cheer as always ! Wonderful Sangee! 300th Post! That's really a milestone to celebrate and these kaju rolls are perfect for the occasion. Keep up the good work! I like reading through your posts where you share small incidents about your family. Would love to be part of the giveaway. Have been following your space since long, liked your FB page as well as subscribed thru email. Congrats Sangee on ur 300th post, kaju pista roll summa athiruthula, we sometimes goes mad if its comes to our blog baby na, its happens for me also,sonna siripinga i cooked once at 4am morning for my space..My h told the same as urs:d..
Congrats on your 300th post,wishing you many more ahead.Kaju rolls look awesome and gorgeous,will try it soon.Its one of my fav.and already following you.Even my H also told the same thing before even I started blogging.But these days it has become more. Sangee lovely sweet and congrats on your 300th post and wishes for many more to come. Congrats on your 300th post! These Kaju Pista Rolls look amazing...just like the ones I see at the mithai store. Great Job! Gal I can see my self in your followers.. congrats!!! for your great number. VEry nice pics. looks wonderful and yum!!! Congrats on your milestone! Sweet looks yummy! I love this rolls very much. COngrats Sangee. Hugs to you and keep up the good job. You know I already follow you on G Connect, facebook and now subscribed to you da. BTW that's a very wonderful and thoughtful giveaway. And thats an awesome way to celebrate...perfect dessert. Rolls looks tempting..Already following u dear. waiting for the lovely book to arrive coz I have an oven now!! Following ur space now and have Liked you on FB and subscribed to ur posts via email :-) Happy to do so!! Congrats and wow! those kaju pista rools look reallyu tempting! Hearty congratulations on your 300th post..and wish you a great success in future also! Congrats Sangee ! and already following u on FB / email .. Thanks for stopping by my pad..happy follower now on. There you go sangee, congrats on reaching the milestone dear. I could barely do a single post weekly these days. You are on a roll. Kaju roll is sinfully delectable. Keep it coming. I would like to participate in the giveaway. Following blog publicly, liked on FB and subscribed to it via email. Hope i had thru' with all your rules. If not, pls let me know. enjoyed reading ur write-up.....veetukku veedu vaasappadi ....same "nakkals" from the husbands every now and then and trouble photo shooting with the kids !!! Congrats on ur 300th post !! that is indeed a long journey !!! hi sangee - first congratulations on ur 300th post ...great going !! love ur posts. Congrats Sangee.I'm already following u,now in FB and subcribed via Feedburner.Thank U.
Congrats on the milestone! Blogging sure is so addictive! Following you on FB! Hi Sangeeta,Congrats on the 300th post.My mom make this type of rolls ur looks super delicious. Thanks. First time here. Nice blog. Glad to follow you. Kaju rolls sounds innovative, gorgeous and delicious. Looks so yummy!!!!! !Ifeel like having one just now. to pay a visit this blog, Keep up the fastidious job. Muito obrigado muito útil . Será certamente compartilhar local com meu amigos .